Same here. Freezing regularly. Not too bad if you turn off 'stream prices.' But now, even with stream prices on, '20ms - prices' on API settings has vanished. Lately I have problems opening the video stream from geeks toy, most of the times it's not loading and I have to go to betfair site to watch the race. It's just me? Maybe betfair changed something, some races don't open on their site also. The software requires IE11 on the machine to play videos. It also requires flash, and every time there is a flash update, it can stop working. So, try viewing live video from the betfair website using IE11, not any other browser. If that works, then it should work via the software. @The other Geek - I have IE 11 & W7 and I made an update today for flash player, but still have issues like in the picture. I need to close the window and open again..sometimes the streams starts, other times I need to go on betfair site, but lately I had problems there also. I was thinking, maybe they made some changes. Usually I use chrome for betfair site. Video streams working better since yesterday. Dear Geek! I realise that this it not coonected to the below topics and hope for your kind understanding! I am trading of betfair.com and my friend recommended me your terminal as best for trading and that there was a promotion from your side just recently- the was an opportunity to buy the lifetime licence just for 120 Pounds. I just have heard now of this offer and did not buy it. If you could let me to procure the lifetime licence I would be much appreciated for this kind offer! I have just bought version 1.4. The problem is in the opening display under the ID lines there is a blank black screen where there should be Betfair Markets. Does anyone know if this is a common or easily fixed problem? 1. betfair live video window - If I want to load between profiles, betfair live video window will not open after the new profile it's loaded. It does nothing when I press on the tv ico. I need to close GT an open it again. 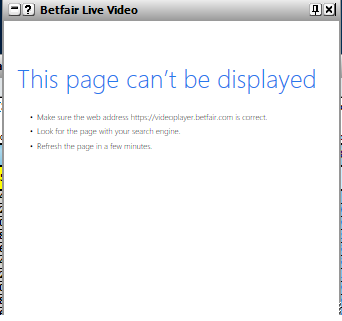 The only fix to this issue is to open betfair live video before loading another profile. 2. market freezing - it's not happening all the time, but if I want to change between profiles, after new profile it's loaded, market prices will stop refreshing and I need to close the market and open it again. It's a problem when markets turns in play and if I need to close the market and open it again, I will lose the progress update of the race timer bar. I also have both of these bugs, they are not new bugs, they have been there for a long time. You can from memory get the LV to display again if you go into the show/hide menu and alter the LV window status, this saves having to close the program down and reopening it. I also have the market freezing bug happen some times and usually I have to shut the whole program down to get it to work again. Thanks for the tip with show/hide menu for live video, I forgot about that option. For market freezing when loading between profiles, closing the market and open it again worked so far. Running betfair 1.4o, everytime I open the Betfair live feed, the whole market just hangs until the windows has loaded. I never used to have this problem.